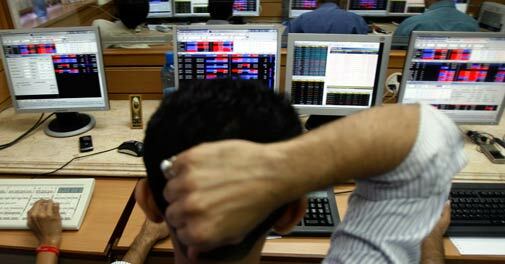 Rules designed to protect the Indian investor are paradoxically destroying investor sentiment. Cut to Arun Kejriwal, an investor and market analyst, whio wanted to invest Rs 50,000 under the Rajiv Gandhi Equity Savings Scheme (RGESS) for his grandson. But he was not allowed to. Says Kejriwal, "As my grandson had a demat account, I was told he was not eligible. Without verifying whether or not he had ever held equities in the demat account, he was bluntly denied a chance to invest in RGESS." Interestingly Kejriwal's grandson was then only 28 days old. The family had opened the demat account on his birth as they had bought tax-free bonds in his name. It's not just banking or the equity market where over protection and regulation have killed enthusiasm. On July 7, 2014, the BSE Sensex touched a new all-time high crossing 26,100 points, but the fact is retail investors did not make substantial money. Nor have they benefited much from the recent rally which started after the new government led by Narendra Modi came to power. When the Sensex touched 5,000 years ago, brokers and distributors celebrated by distributing sweets and sending balloons in the sky. In the last 10 years transaction cost has come down drastically. India would be one of the best regulated markets in the world in terms of investor's protection, but the problem is you cannot find investors. India has become a model market in terms of laws but nothing is happening in terms of prosperity. "Over-regulation has made the market unfavourable for investors. Why would someone come into the market as an investor when his interest isn't protected by the company or the regulator," says Kejriwal. He adds, "Section 100 of the Companies Act has been a curse for the investor. It is often used for easing out minority shareholders. In fact SEBI has gone one step forward by allowing companies to squeeze out minority shareholders." Section 100 permits a company to extinguish capital. "In some cases the companies, after delisting, have increased the face value of their shares and canceled the shares of minority shareholders on the grounds that they have become fractional shareholders. What's disappointing is that no court or regulator can help these investors." "No Indian investors and intermediary is making money. So even though the Sensex is above 25,000 I am not sure if retail investors were on board and managed to make a killing. I know for a fact that brokers are struggling and many have in fact diversified into property broking," says Amit Maheshwari, Managing Partner at Ashok Maheshwary and Associates, a Delhi-based financial consultancy and chartered accountancy firm. "Why would someone (any intermediary) invest when he isn't making enough money," says Nilesh Shah, Managing Director and CEO at Axis Direct. "Sebi has capped the broking commission for mutual fund that at a maximum of 12 paise for every Rs 100 value of transaction. This is too small a fee. If a fund manager can manage crores of rupees he can also be sensible in paying fees." He adds, "What Sebi's capping of the commission has done is that others are also paying low commission. Everyone wants five-star service at Udipi rates. That's not possible and therefore players are only servicing people who pay five-star rates. But this has destroyed the industry as not all are serviced and thus shunted the growth in the market," says Shah. "I agree that over regulation has not helped investors in creating wealth. The effect of over regulation is that our markets are not deep or liquid. See the bond market for example. In US, the bond market is three times the size of the equity market. Still, over regulation and protection not may not have helped in creating wealth at the same time it has not led to rapid erosion of wealth," says Maheshwari. A senior bureaucrat who has been in the finance ministry says on condition of anonymity, "The government doesn't really mind if Indian investors don't come into the market, but at all costs it doesn't want any mishap in the market which would require it to clear up the mess." "As a regulator my job is to see that investors have trust in the market and we at SEBI have taken reasonable measures to prevent any mishap," says UK Sinha, Chairman, SEBI. "Everywhere in the world the market has been revived on two counts. The first is tax support and the second is pension money. If similar support comes from the government we may see a revival in the capital market." Securities transaction tax (STT) when introduced in 2004 was reasonable, but over the years it has increased substantially. STT and stamp duty are the major costs. Currently STT in the cash market is levied at the rate of 0.1 per cent on both the seller and the buyer. On derivatives, the tax is only levied on the seller which ranges from 0.01 per cent to 0.125 per cent. IPO markets cannot be vibrant till the secondary markets are vibrant. IPO markets are still some distance away from a proper revival. Making a business plan fund through the IPO is also getting to be a challenge as the present law demands implicitly secure and safe return for investor, fair pricing of shares and business delivery record. Hence, easy underwriting is not possible. There is no concept of official and realistic market making for all companies getting listed. This has also affected the investor sentiments. Says Shah of Axis Direct, "There have been so many companies whose shares after the issue were trading at a discount, why didn't the regulator catch the company or the investment banker for over-pricing the issue? Today the focus is only on information and it has made filing an IPO cumbersome rather than focusing on growing the market and increasing retail participation." At this juncture the IPO markets are mostly dry. One hopes that, if the secondary market continues to be buoyant, there could be a revival in the IPO market in the second half of this year through IPOs for ecommerce and PE invested ventures. Certainly a lighter and more pragmatic regulatory environment can boost the market sentiments quickly. "In fact a dull IPO market does more damage to the economy and the markets than dull a secondary market," says C.J. George, Chairman at Geojit BNP Paribas Financial Services. "After the introduction of free pricing of IPOs, promoters have become more greedy and investment bankers are exclusively serving them without considering the needs of investors. Therefore when the IPO market is dull nobody wants to raise capital and when the market becomes active everyone comes with over stretched valuations, resulting in investors deserting the market due to losses in IPOs." He says that investment bankers have lost touch with investors, particularly retail investors. But most importantly at the current rate of commissions no broker wants to meet retail investors to educate them about an IPO and to complete the application formalities. During the days before free pricing the brokers and the sub-brokers used to get commission on the average 2.5 per cent of the amount raised by the IPO, which has now come down to 0.10 per cent. At this rate no broker will ever bring any new retail investor into equity market, which is dangerous for the market. "Ivy league investment bankers have killed the market," George adds. "They only thought about servicing institutional investors. With the commission rates crashing it also killed the sub-brokers who were playing the developmental role of bringing new players into the market." Most of the retail investors entered the market traditionally through the IPO route and this factor is the most important reason for the diminishing retail investor population in the country. In the past three years only Rs 14,000 crore was raised from the primary market, compared to Rs 37,000 crore raised in 2010 alone. Says George of Geojit: "Intermediation should be encouraged and must be enabled through appropriate enabling regulations, instead of making it difficult for intermediaries to operate. 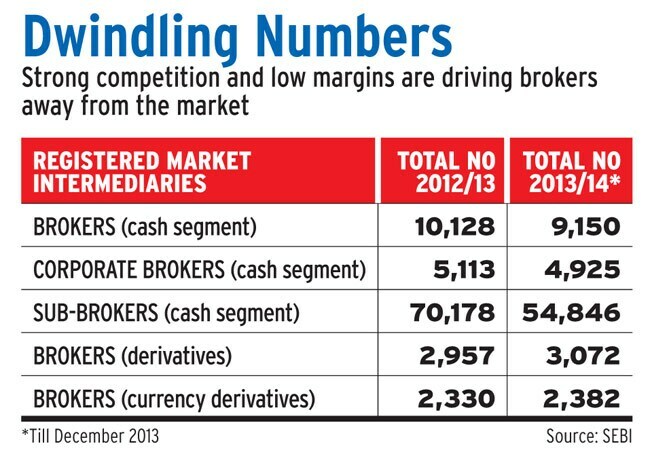 During the last six years a significant section of broking community including the sub-brokers disappeared from the market due to tough regulations and consequent high operating cost." Even today a commodity sub-broker cannot do equity sub-broking. He cannot offer many products and therefore he struggling to survive. Adds Oswal: "The investor base is not increasing and one of the reasons is the regulatory hurdle like the KYC norms. Unlike for the purchase of gold and real estate, in equities one requires KYC as well as a DP account." Oswal isn't against regulations but the fact is in a country where half the population does not have a bank account, how can you expect them to have a DP account. One way to increase retail presence in the equity market could be to ease entry norms for retail participants. "This would mean anyone with minimum investment of Rs 2 lakh should be exempted from submitting KYC documents," says Oswal. Still, in a ray of hope, Finance Minister Arun Jaitley, in his Budget speech of July 10, announced the government would introduce uniform KYC norms and inter-usability of KYC records across the entire financial sector. A single demat account for all financial assets has also been proposed. Similarly, the mutual fund business is dying its own death, as there is no incentives to sell the product as well as the broking business which demands more money to run the business. There has been a substantial fall in folios as well as in AUM. 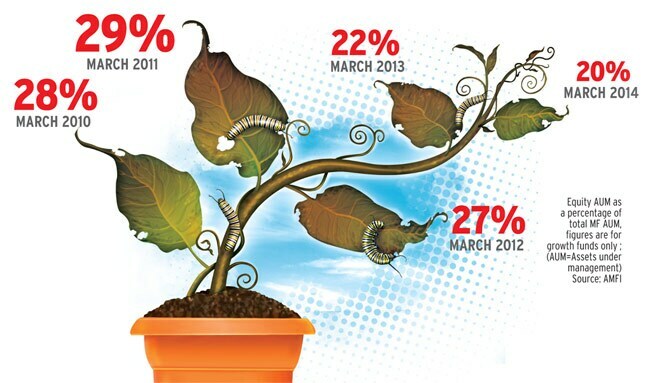 At the end of March 2008 equity AUM used to account for 31 per cent of the total AUM of the mutual fund industry but today despite the recent rally in the market, equity AUM account for 18-20 per cent of the mutual fund industry. "Sebi was way too early to ban entry load and MF agents and distributors have disappeared in a big way. The American and European markets which despite being deep and big in size still compensate distributors lavishly and hence they bring funds and investors to the market," says George. He once supported the banning of entry load but the aftermath has seen him change his mind. "An agent will take some time to reach a critical minimum level of AUM to support his activities commercially and then only we should think of reducing commissions. Although the ban of entry load was with a genuine intention it was very untimely as Indian agents have not reached that critical minimum level of AUM to continue in the business." In 2009, Sebi banned entry loads in mutual fund which meant that investors investing in mutual fund could invest without paying commission. "On the one hand the regulator wants to control the commission paid to agents and distributors, on the other he does not want to regulate them. When agents receive huge commissions selling real estate, why would they bother about selling financial products, especially mutual funds where you receive trail commission," adds Shah of Axis Direct. The regulator though wants retail to come through mutual funds and is keeping a close watch on mutual fund houses. Says Sinha, "I believe retail investors should come through mutual funds - investors expect better returns from mutual funds than the benchmark index in the long term. Fund managers are experts and investors pay them fee for managing their funds. They are expected to provide alpha to investors in the long term." "The problem with low incentives is it encourages distributors to seek higher ticket size of investments and hence they focus on the HNI segment rather than the mass market segment," says Shridhar Iyer, CEO at Sundaram BNP Paribas Fund Services. "In reality only 20 per cent of the money in mutual funds is from retail customers. A massive 49 per cent comes from corporate houses, while the remaining chunk comes from HNI and banks." Apart from the need for simpler norms and proper control, there should be harsh punishment for those who break the rules for personal benefit. There is no fear of the law when it comes to financial frauds in India. It's almost two years since the Rs 5,500 crore National Spot Exchange (NSEL) fiasco occurred but till date there hasn't been any relief for the investors. Indeed the NSEL fiasco has made people even more risk averse, with the overall business now in a state of sheer confusion and negativity. The government wasn't much bothered by this particular scam as there are very few retail investors on the NSEL. Most of the people caught on the wrong foot were HNI investors or small to medium entrepreneurs. "There was a lot of artificial volume in the commodity market as is now known, post the NSEL scam. Hence it may not be right to say that volumes are disappearing. However it can't be denied that the introduction of CTT has seen volumes dry up on the commodity exchange," says George. "The only way to develop a healthy commodities market is to attract hedgers into the market. Hedge funds have largely stayed away from highly speculative markets. Only a vibrant institutional platform will help the market to regain the lost glory." Forget the NSEL fiasco, even in the Rajiv Gandhi Equity Saving Scheme (RGESS), government intentions seem half-hearted. The idea was good, but there are so many restrictions - such as only a first time investor gets a tax benefit from investing in it, the money raised can be invested only in top 100 companies, etc. This has not even seen Rs 250 - 300 crore coming into the market in 2013/14. Even if the government had increased the investment limit to Rs 1.5 lakh from Rs 1 lakh, there could have been a rise in participation. Rather than focusing on growth of the capital market, the government has only taken measures to avoid mishaps. The mindset is that the equity market is a gamblers' den. Efforts have to be made by the government to encourage equity investment and make domestic investors aware that the equity market is an avenue to grow one's capital. Before that the government should itself be convinced that the equity market is an engine for economic development and speculation is not necessarily a dirty word. In 2008, the government allowed employees' provident fund organisation (EPFO) invest up to 15 per cent in equity from five per cent, but all in vain as the EPFO has stayed away from equities. Why only equities, the debt market also faces huge hurdles. For instance, private placements dominate the corporate bondmarket and there is very little available for circulation and trading in secondary markets. Retail participation is very low in secondary market. Typically buyers are institutional investors like bankers, insurers and pension funds who do not enter the secondary market. Most popular are government securities and since many institutional investors are mandated to invest in these, there is little money left over for the corporate bond market. Banks are not permitted to invest in below investment grade securities. Insurance companies and pension funds are constrained by various norms that govern investment in bonds. Stamp duty is not consistent across the country. Also tax deducted at source (TDS) in respect of corporate bonds is a limiting factor. Indian corporate debt market does not have market makers. Says Maheshwari, "Too many regulations. SEBI, RBI, IRDA and PFRDA have different objectives and hence the debt market suffers. Disclosures should be reduced so that there is a shift from private placement to public placement." Corporate Bond market is only around 5-6 per cent of the debt market. Default rates in corporate bond market is higher in India. Non-banking investors of corporate bonds cannot have recourse to SARFAESI act and CDR. So mutual funds stay away. I think for most financial products you don't have enforceable bankruptcy procedure. Government is taking steps to improve liquidity and depth but that has still not happened. Credit default swaps in corporate bonds were introduced but have not been developed. Our regulations insist on the financial institutions on investing in G-Secs which leads to lesser money flowing in corporate debt market. Says George, "A strong and co-ordinated move by all the regulators will only be able to develop an active bond, currency, interest rate and commodities market. The Indian stock brokers have disappeared from the market due to absence of alternate products when the equity market is dull. The biggest market ideally should be the corporate bond market in terms of number of investors and the absence of such a market has killed the economics of retail intermediation business forcing them to shut shop. We need to develop this market for the corporate sector and for the retail investor." On the other hand the currency market witnessed the fastest growth in terms of volume compared to equity and commoditymarkets. One of the reasons for such a quick growth was the timing of its launch. It was launched in the mid of global financial crisis with a lot of bold steps by RBI and Sebi. "The challenge currency derivative faced is due to weaker policy about the participation of banks and institutes. Even though Indian currency is a partial convertible currency, but due to flaws in the policy it ends up becoming fully convertible without the knowledge of the regulators," says Pramit Brahmbhatt, CEO at Veracity, an Ahmedabad-based financial services firm. Flip-flop in margin requirement has also acted as a hindrance to the growth in the segment that put off SMEs and day traders. Says Brahmbhatt, "We need to distinguish between the type of participants -hedgers or speculators. By doing so we can give more flexibility to actual hedgers and controlled policy for speculators. If we take example of CME, the client has to provide the reason for participation in terms of hedging or speculation and the guideline for each case is different." He feels the segment can grow if the regulators introduce OTC market in controlled environment as well as give option to provide physical settlement instead of cash settlement. "The need of the hour is to introduce more innovative and sophisticated product into our market. Rather than shying away from sophisticated products we need to embrace them. Retail participation through transparency, innovative products, depth and liquidity is the key for the growth of the overall financial market," says Rashesh Shah, chairman at Edelweiss Capital, a Mumbai-based financial services firm who believes that we are at the cusp from where it's going to grow with the equitymarket back on the runway. Adds George of Geojit, "Historically the equity market in the long term has given an opportunity to the investor who invested at the previous top to exit with a profit. Hence I am of the view that the market will have to cross this 51000 points to really celebrate." Too much regulation and compliances will move capital and ideas to markets where there is more value to such inputs than in markets like India. Businesses sole aim should be profits and not CSR as a mandatory action. Today investors are discerning and know how to value business. There is no need to micro manage in everything. This could lead into a big challenge and a catastrophe soon, unless genuine concern and responsibility is reinstalled in the markets and its divergent participants. Focus of broad economic policies and their implementation will need to be integral with capital marketperformance. Swings should not matter. Too many regulations will only lead to too little compliance and high cost with limited benefits. The most important need of the hour is to bring confidence to intermediaries and investors equally. We have a situation in India where an exchange was permitted to function openly for many years - considered as a jewel by many- in front of all regulators and when it failed and gone bust no concrete action was taken to protect the investor's interest. Then there is an attempt to blame the intermediaries for the whole scam. In fact we do not have a developed ecosystem for a developed market. It will not be the size of regulations that makes a market healthy and strong. It will be the speed at which the guilty is punished and ill-gotten wealth is recovered to compensate the one who lost that determine the strength and robustness of the market. Only if this is ensured the investors and intermediaries will come back to make Indian markets work.